In the late 2000s, Van Horenbeeck worked at Microsoft as a manager who helped release security updates for the Windows platform and protect users of the operating system. The main challenge for him was building security into Microsoft products and creating a culture of security. 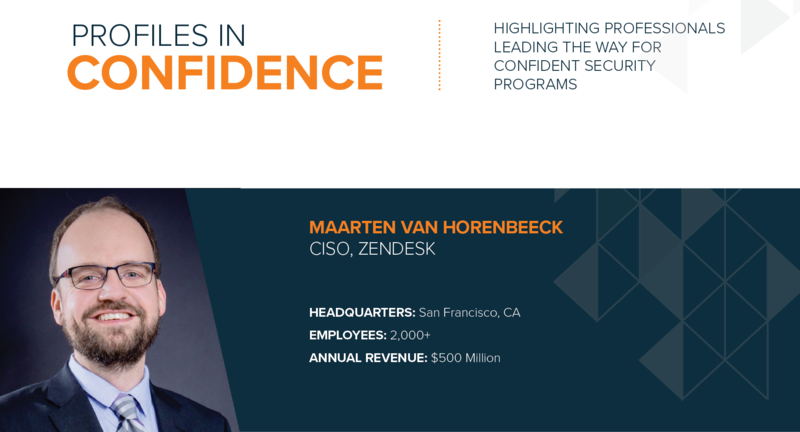 After other high-level positions in information security, Van Horenbeeck joined a startup company where he built out the security capabilities from the ground up before moving into the CISO role at Zendesk. “We came up with what our purpose is in the organization, and I like the term purpose over mission because when you have a mission, it implies that there’s an end to this. It’s important to note that when you have a mission and you fail, people will be very disillusioned. I’ll give you an example. If you have a mission to protect the enterprise from a breach and you have a breach, then you effectively fail at your mission and people will feel disappointment with the work that was delivered or what was done. The important thing to acknowledge in security is that you will never get everything perfect,” says Van Horenbeeck. For Van Horenbeeck and his team, having a sense of purpose solidifies their core goals of protecting the company, customers, and employees from threats. Even if an incident occurs, his team still uses their purpose to take the right action items to make sure they protect data or people to the greatest degree they possibly can. The goals supporting his teams’ purpose are building a security culture, ensuring effective prioritization, supporting business decisions, and becoming a learning organization. “My main goal is that we do things that are repeatable. We must be consistent and make sure the teams understand why we do what we do, and that leads to a level of trust that allows them to interact with us more effectively. We also need to understand where we are today, what our gaps are, and how we can reduce risk. We need to understand what that risk is, communicate it effectively across a wide set of individuals, both at a technical level and executive leadership level, and make sure that we can help them drive the right business decisions to balance that risk against growing the organization or doing great things for our customers,” states Van Horenbeeck. In a recent meeting, an employee asked Van Horenbeeck what keeps him up at night as a CISO and the biggest threats facing Zendesk. He replied with an unexpected answer by revealing his greatest concern was being able to hire and retain great people. He explained how everything in security starts with good people who can help move the needle. While hiring in security has become incredibly challenging, especially in the San Francisco area, it is vital to create an environment where people want to work and where they can apply their passion to protecting the company, employees, and customers.